Eleven projects from Brazil to Zimbabwe received, between them, a total of £200,000 to support their work on environmental and social regeneration. The winners demonstrate the variety of approaches that can be taken to create a more regenerative society: from restoring degraded landscapes to creating platforms that give a voice to marginalised communities. The Influence Award (£25,000) went to La Via Campesina, for their lobbying and campaign work that is trying to influence policy and public opinion in support of small scale agro-ecological farmers around the world. The winners received their awards during a two-day event at Emerson College in East Sussex. Emerson College is surrounded by organic farms and demonstrates the regenerative practices embedded in parts of the English rural economy. 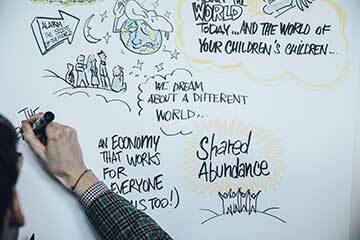 Creative Connections capture visual minutes at the 2018 LUSH Spring Prize convergence.